I had a need to run a certain PHP script on a regular basis as a part of my blog maintenance. Since GoDaddy uses the more-or-less standard cPanel which includes a Cron Job scheduling option, making this happen was fairly trivial. This is a quick guide to show how to schedule a PHP script to run automatically at regular intervals. I am assuming that the Linux cPanel is used in this case. The first thing that is needed is to find the name of the home directory. This is displayed in the top left on the main cPanel page. The name of this directory is the same as the cPanel login, so if your login as 'bob_the_builder', the home directory will be /home/bob_the_builder. 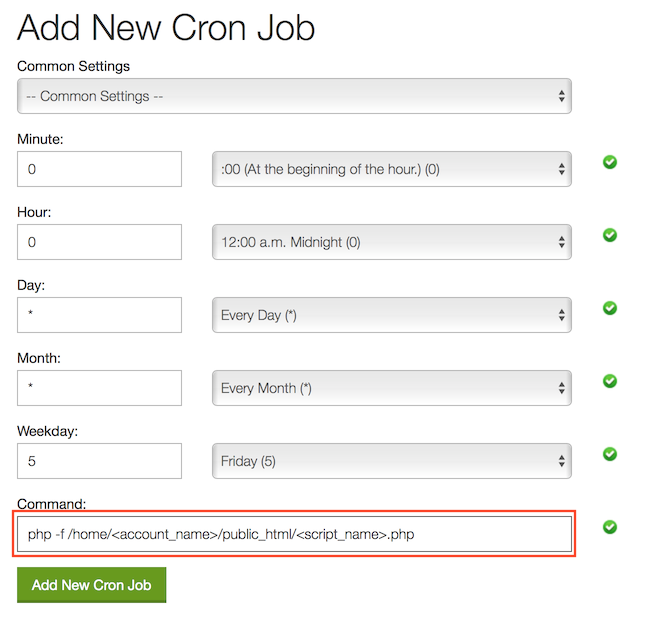 Now with the home directory name handy we can schedule the Cron Job itself. Head down to the 'Advanced' section and click on 'Cron Jobs'. Under the Add New Cron Job section, select the scheduling. There is a handy drop down that gives a number of usual configurations to pick from. After picking the scheduling times, the important part is to enter the command correctly. This assumes that the PHP script is in the public_html directory i.e. the root directory of the web site. Simply put in your account name and script name to make it work. If you need a way to passing parameters to your script, check out this article - How to pass parameters to your PHP script via the command line.